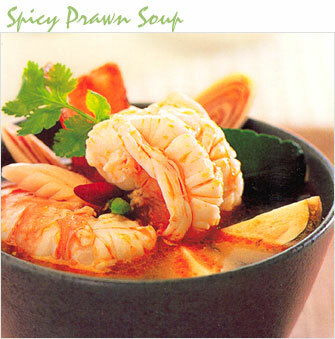 The most famous Thai spicy soup. I believe everyone either tried or heard about this fabulous soup before. Whenever I eat out at a Thai restaurant, I won’t miss this soup. 2. 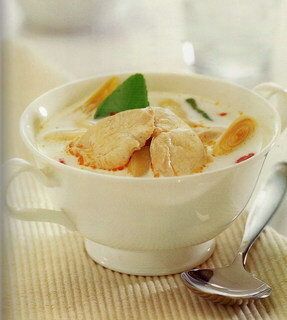 Dtom Kaa Gai (ต้มข่าไก่) : Chicken soup in light coconut with lemon glass, cherry-tomato, mushroom. This simple Thai chicken soup has that distinctive Thai flavor – a balance of spicy, salty, sweet and sour. You know what the best thing is about this soup? It is the perfect one pot meal. You only need a plate of hot steamed rice and nothing else. I have cooked this soup for a hundred times. It is easy, delicious also provide you with added health benefits. One of Thailand’s best known noodle dishes. It is eaten at any time of the day or night, and is especially popular at the night markets throughout the country. I never cooked this dish at home since you can find it easily anywhere. Personally, the best place for street Pad Thai is in Thong lor next to the BTS station. 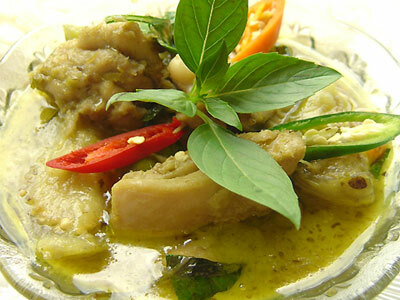 Green Curry Chicken is loved by most people, especially those who can’t take hot stuff or don’t enjoy “mouth-burning” feeling but want to eat Thai food, because it is not as hot as other Thai dish, in fact it is pretty sweet. “Gra prao” or holy basil is a Thai herb, it’s used for Thai cuisine as spice and a medicine for traditional Thai medicine long time ago. It is all time hit dish. Ga-prao can be made with ground or sliced chicken, beef, pork or seafood. It’s usually served as a one-dish meal, a quick meal eaten over rice, and is usually topped with “Kai Dao” (Fried egg). It is quite simple to cook and the result is very delicious! Click here to see my Top 5 favorite Thai restaurants in Bangkok. Hi, I am a big Thai food lover. 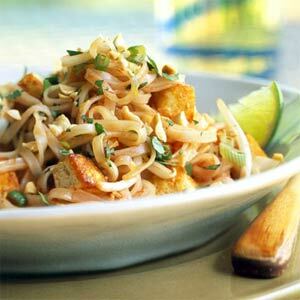 Dtom Yam Goong and Pad Thai are my favorite Thai dishes. I love eating at Thai Square restaurant in London. Have you heard of it? It’s the best Thai restaurant in London in my opinion. Anyways, thanks for sharing this list. Yes, I know about Lao and the Thai and which is which. 1. What about som dum w/sticky rice? 2. What about lop neua, lop gai, lop pet, lop plah, etc.? And don’t forget: tum mai dong k(g)in? Because we love it–hhahaha. Hi Mon…your blog updates seem to be working in Google Reader, even though it showed an error 🙂 thanks for looking into it for me. 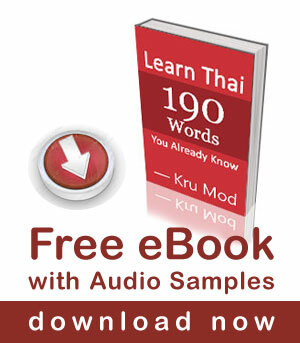 I found your blog via Women Learn Thai…very nice! I was wondering if you offer subscription using Google reader, and not just the RSS feed? It seems to be the only way I can add you to my blog roll, on both of my blogs. Unfortunately, I don’t know how to offer subscription using Google. I will find out and let you know. I always put the link there every time I update my blog. Such a hard choice… I love all of these dishes.. I think Dtom Kaa Gai would have to be my favourite though… it’s making me hungry just thinking about it! Sawatdii ka Andy, Dtom Kaa Gai is also one of my favourite soup. Such are hard choice… I love all of these dishes.. I think Dtom Kaa Gai would have to be my favourite though… it’s making me hungry just thinking about it! If I were to order a dish in a restaurant, how would I ask for something without mushrooms? I am sorry for my late reply. I have just come back from my holidays. 1. a negative request we say : mai(falling tone) ao(middle tone) + noun. = ao Dtom Yam Goong, mai ao het. Khob khun maak krap. I’m trying to learn as much as possible for a trip to Chiang Mai (for Songkran), A motorcycle trip through Mae Hong Son and a couple weeks in Phuket. I appreciate all your videos on youtube. If only people were so nice and polite here in Los Angeles! Different cultures I guess. You are right – different place, different thing. Thank you for visitng my site. As you know I am a bit of a foodie myself. And have tried all of these dishes and made most of them as well to include a dtom yam goong family recipe of a very nice Thai language teacher I know:) It is a fine list to be sure and easy to understand how you came up with these five dishes as a starting point to one of the very best culinary cuisines in the world. As for me personally I could enjoy any one of these wonderful dishes with equal pleasure depending on what I am in the mood for at the time. That being said if I was undecided as to what to have and these five dishes to choose from my first fall back favorite of these would definitely be pat gra pao. Any meat anytime any place it’s just simple delicious food with lots of wonderful flavor. If you have never had this delightful dish before the ground chicken version of this dish is the bomb. Peasant food at it’s very best!!! 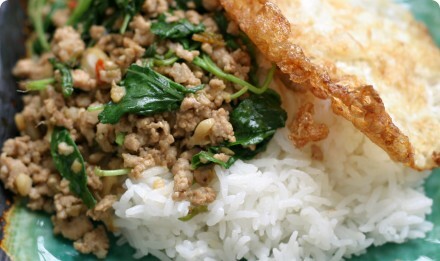 Replying many messages on this blog made me hungry for pat gra pao&kai dao. Thank you for visiting my site. I’ll have a look at your website and let you know.